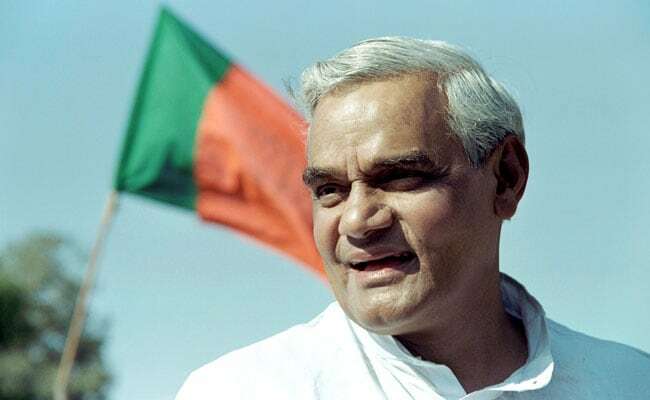 Recounting the trauma that he was undergoing while uncertainty of his survival loomed large, Atal Bihari Vajpayee described in the poem that he had almost accepted the end. Atal Bihari Vajpayee's eloquent verses were remembered by his admirers. Much as he was revered as a stalwart politician, former Prime Minister Atal Bihari Vajpayee, who passed away at the age of 93 in New Delhi on Thursday, was widely recognised as a key poet in Hindi, who took poetry beyond the pages of his collections and recited them at numerous public fora. As news of his death plunged the nation into mourning, his eloquent verses were remembered by his admirers. One particular episode that deserves mention took place in the year 1988 when the Bharat Ratna awardee was in the United States for kidney treatment. In a letter to playwright and his contemporary Dharamvir Bharati from the United States during his treatment days, Atal Bihari Vajpayee said he peeped into the eyes of death" and captured the agony in a poem titled "Maut se than gayi" (Faceoff with death). "I had no intention of fighting/ there was no promise of meeting again/ she (death) blocked the path and stood on the way/ in a moment she became larger than life," he wrote. In the letter originally written in Hindi, Atal Bihari Vajpayee added: "Maut ki umar kya hai? Do pal bhi nahin/ Zindagi silsila aajkal ki nahin/ Main ji bhar jia/ Main man se maru/ Lautkar aaonga/ Kuch se kyun darun", reflecting that death too is temporary and lasts only for a while in an ageless cycle of life. The former Prime Minister noted that he had lived to the fullest and would die with satisfaction, and would again return from his travels. Notably, when he had written the letter to Dharamvir Bharati, doctors had suggested him to undergo a surgery. This suggestion had caused an anxiety in his mind and Atal Bihari Vajpayee, revealed in the letter that this poem was written in that frame of mind. It is also interesting to note that then Indian Prime Minister Rajiv Gandhi was responsible for sending Atal Bihari Vajpayee to the US for treatment. In a delegation headed to the United Nations, Rajiv Gandhi had included his name so that he could be treated there. Atal Bihari Vajpayee made his gratitude public to Rajiv Gandhi and would often say that he was alive because of him. He emerged victorious in this "faceoff with death" and would go on to live for another three decades, serving thrice as the Prime Minister of India, first for a term of 13 days in 1996, then for a period of 11 months from 1998 to 1999, and thereafter for a full term from 1999 to 2004. Atal Bihari Vajpayee's vision of life is also evident in his poetry. In one of his oft-recited poems, he asks readers why the colour of blood turned white, expressing the larger messages of fraternity and brotherhood. His poems also conveyed the firm belief in marching forward that Atal Bihari Vajpayee accorded great importance in the course of the nation's journey. His "Geet naya gata hoon" (Singing a new song) is widely read and features in several school curriculum books, but he also expressed his disgust with the face of truth in one of his poems, where he went on to say "Geet nahin gata hoon", or I am not singing. He wrote that when the truth revealed its real face, he became fearful of the truth itself and preferred to stop singing, or writing about the truth. And there was a prayer, too. "Mere prabhu/ Mujhe itni unchai kabhi mat dena/ Gairon ko gale na laga sakun/ Itni rukhai kabhi mat dena", where he, addressing to the Almighty, expresses his firm belief in fraternity, in seeing all men as equal and in embracing the others. "Meri Ekyavan Kavitayen" (My 51 poems) is one of his most celebrated poetry collections and provides a ringside view into the mind of the iconic poet that Atal Bihari Vajpayee was. The literary world, like the rest of the nation, will remain poorer sans him. Amit Shah Defends Pragya Thakur, Hits Out At Congress Over "Hindu Terror"